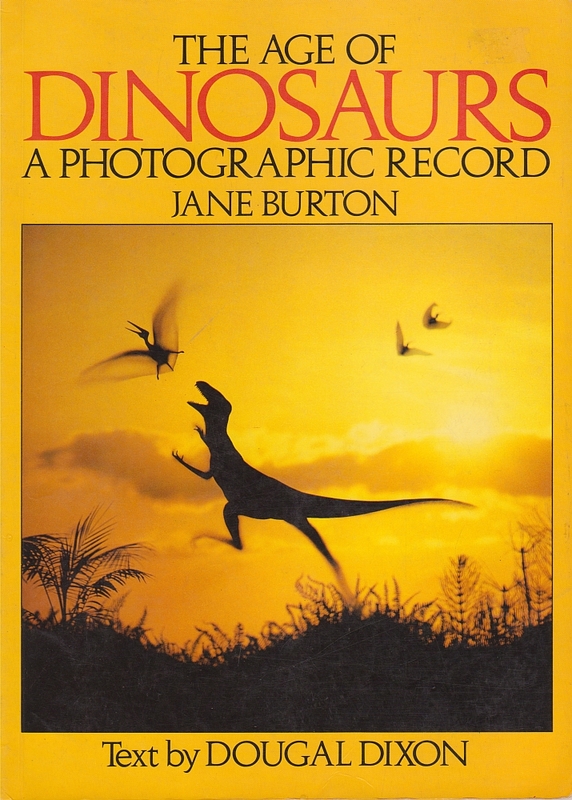 A fairly unusual book for its time (although not unique - see, for example, the earlier Purnell's Book of Dinosaurs), The Age of Dinosaurs: A Photographic Record is not afraid to trumpet the supposed stunning realism that its miniature photography offers. In fact, the blurb on the back cover claims that "now we can travel back in time and observe how [dinosaurs] really lived...Never before has the age of dinosaurs been so realistically shown!" Quaint as the claim might seem these days, 28 years later, it's true that the scenes are wonderfully shot. The cover image is wonderfully striking, and creating a convincing silhouette shot is not as easy as it might seem. "The leg joints and position of the feet show that it could take only very short steps...[its teeth] were very thin and would have been easily broken in any kind of fight." Never mind, though - we're really here to talk about the photography. In each case, Dixon sets the scene - here we are told that this T. wuss is 'waddling' along by a soda lake looking for the next free meal, while "flamingo-like" (ahem) birds fly past "as if it were a rocky outcrop". Nevertheless, the model hasn't aged as badly as it might have, and it's beautifully photographed; the misty effect is lovely, and there's a decent illusion of scale and depth. The relative tranquility of this scene is quite welcome, too - it's a rather dignified portrait of the animal (unlike the text). If it's action you want, you'll have to turn to Deinonychus. Again, the real skill of the photographer here is combining the disparate elements (namely, the models in the foreground and the painted backdrop) and making it all look convincing. 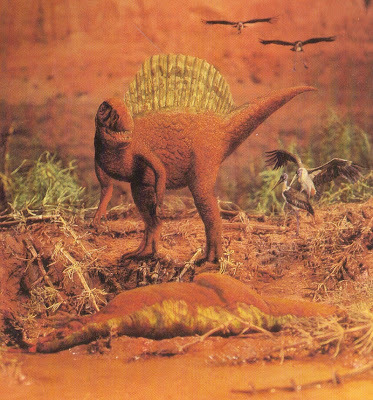 I remember seeing these models in other dinosaur books back in the '90s, and for the time they're very good - not overly reptilian, and I love the way they appear to have been frozen in the middle of a scrap. The poses are just fantastic. It's worth mentioning that, while Jane Burton is (of course) credited for the photography in this book, it's Steve Kirk who was apparently behind many, if not all of the models. 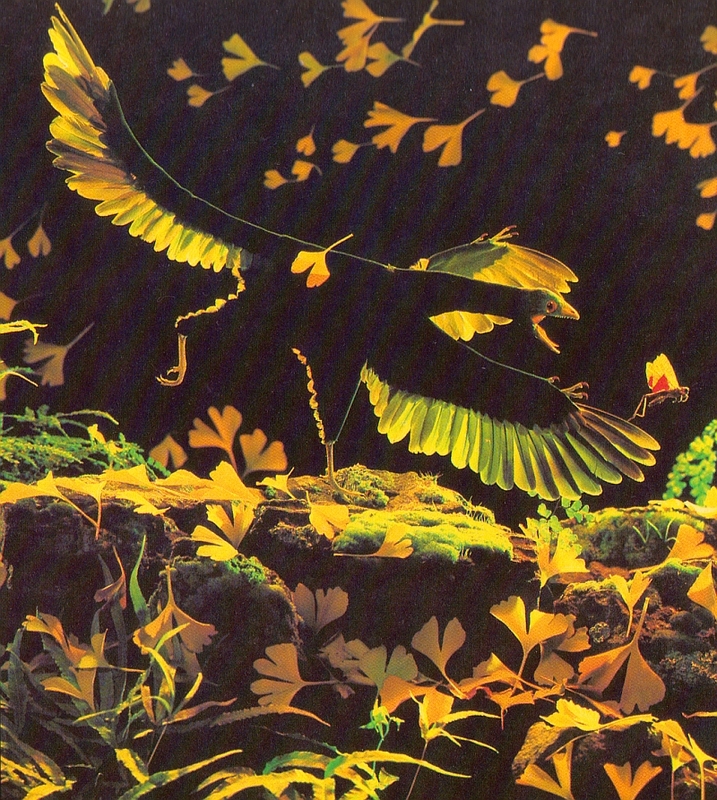 It might be 1984, but you can still count on one feathered theropod - Archaeopteryx. It hasn't scanned very well, but take my word for it - this is a beautiful scene, and the animal looks stunning in its glossy pied plumage. It's a shame about the stick-on mini-hands (or is that polydactyly? ), but still - a wonderfully crafted model. I'm especially fond of the subdued, autumnal lighting and tones (which contrast with the monochrome subject) and the shower of leaves. Saltopus - it's a name that is impossible to say without hissing like a half-baked villain from a kids' TV show. There's just no way of resisssting it. Cursessss! Anyway, this is one of my favourite images in the book, as it genuinely appears as if the photographer has happened upon this animal going about its business in the night, catching a fortuitous snap before it scarpered back into the undergrowth. The lighting is superb, the creature (and its prey) are very convincing, and hey - it's quite an unusual subject, too. 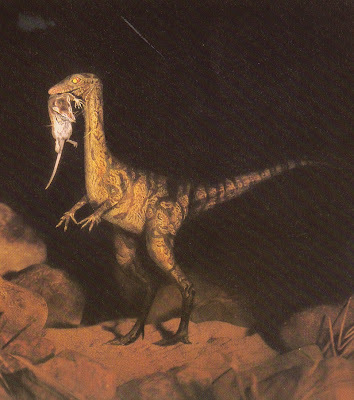 This animal is either a very basal theropod or not a dinosaur at all - rather, a dinosauriform. Unfortunately, it is only known from very fragmentary remains. 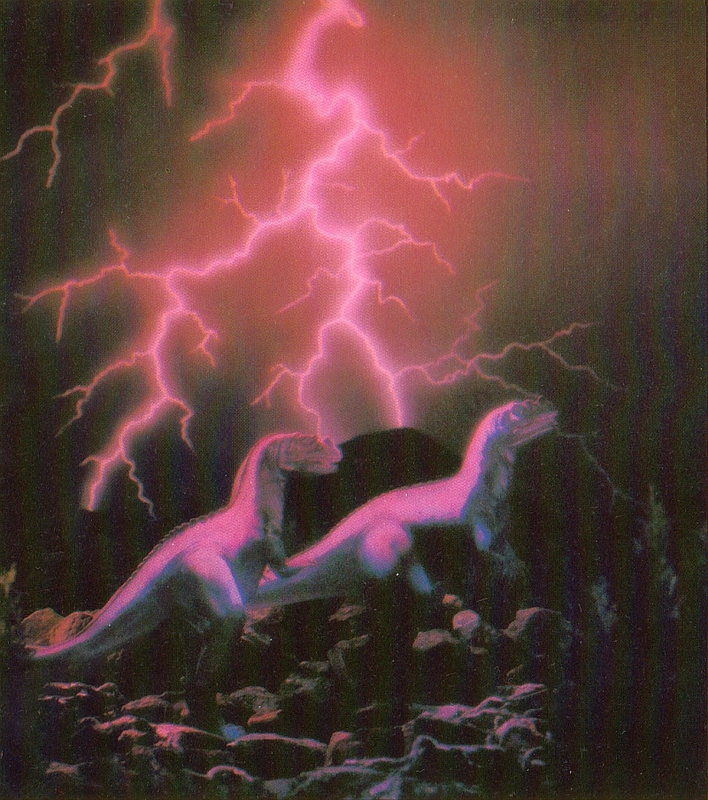 Another of my favourites is this shot of Hypsilophodon and Iguanodon - its creation of a convincing sense of scale is remarkable, as is the apparent motion of the very delicate-looking Hypsilophodon. Quite lovely. One of the less convincing images in the book is this shot of two Ceratosaurus against rather dramatic red lightning. One almost expects them to be fighting with Dracula and Frankenstein's monster - actually, given the sort of movies that Hammer Horror made in the '60s and '70s, I'm surprised this has never happened. Dracula v. Frankenstein v. the Wolf Man v. dinosaurs? Yeah! Just picture Christopher Lee swooshing his cape around in front of a Ray Harryhausen beastie. It would be spectacular. "The tail vertebrae had downward projecting arms with skids at the ends. These probably protected the nerves and blood vessels of the tail as it dragged on the ground." "The whiplash tail evolved as a natural tripping hazard for the giant carnosaurs of the day," he doesn't go on to add. 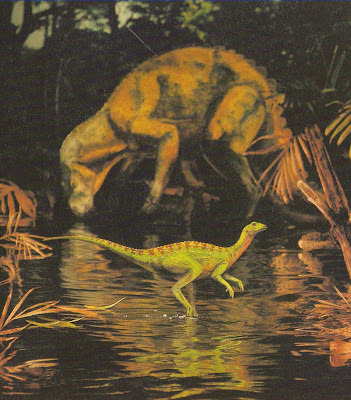 If you're a regular reader of this blog, you'll know by now that I have a soft spot for outdated reconstructions of Spinosaurus. It's mostly down to nostalgia - they were still about in the '90s - but it also provides a pertinent lesson in just how easy it is to misidentify an animal based on relatively scanty remains. 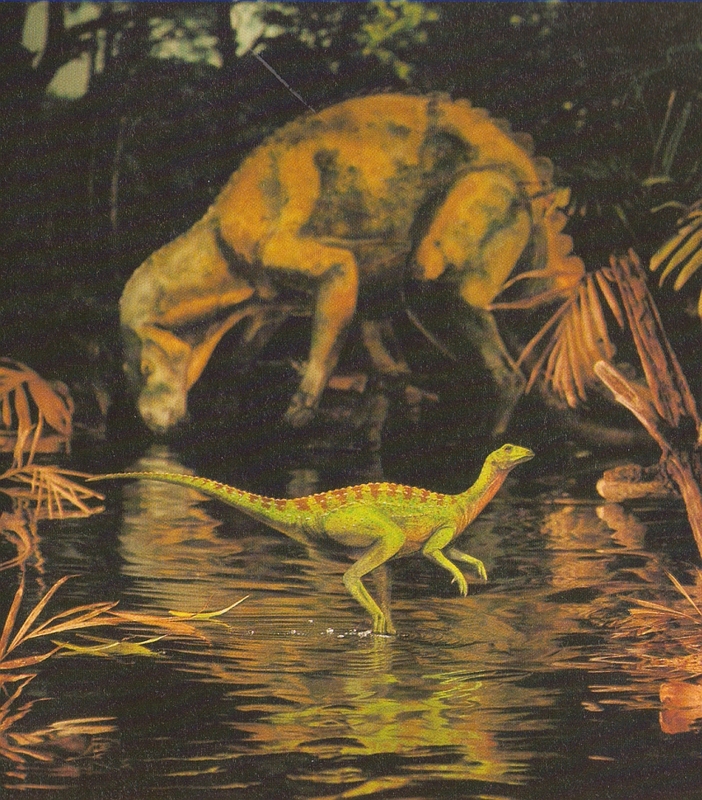 These restorations made good sense in their day - there was little indication of just how strange this animal really looked, prior to the discovery of other spinosaurs and, of course, additional material. The 'carnosaur-headed' creature shown here is very typical and certainly sculpted well enough, even if the skin texture is a little crude. The birds are a nice touch, even if one could argue that they're basically just models of modern Leptoptilos storks. The dusky lighting here is particularly pleasing, giving an impression of a parched landscape while actually showing very little. That just about wraps it up for now! There are many more images in this book of course, and I may well have to revisit it somewhen down the line. One final thing: I feel obliged to point out that Dougal Dixon has revised his thinking since 1984! I'm quite impressed by this book. 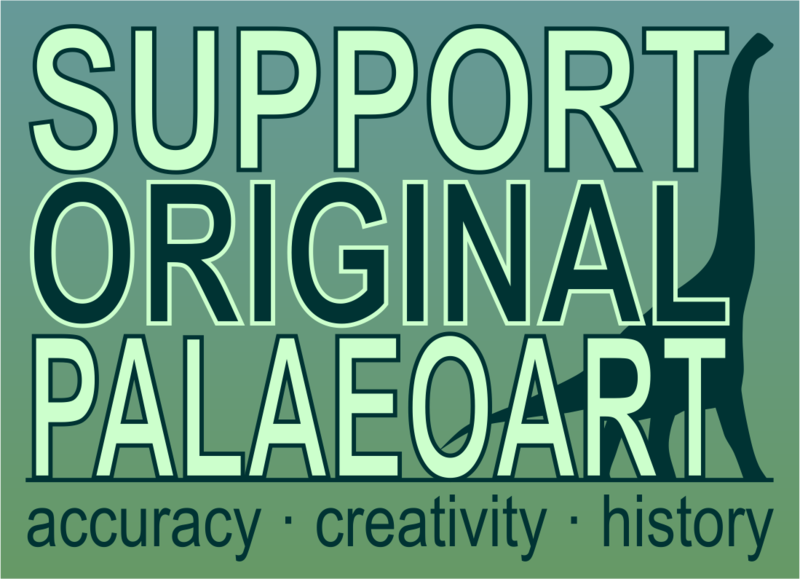 I was going to remark that it was odd that these illustrations aren't better known through re-use, but then I saw the Archaeopteryx and Diplodocus and definitely remember haveing seen those before. By the way, I meant to mention it before, but I really enjoy the artistic weight you've been giving to your descriptions of these artworks in your recent posts. Your paragraphs on the Archie and Saltopus are especially lovely. OK, not really. But I think it's got a lot to do with hanging around with you, along with reading Dinosaur Art and wanting to appreciate the art more as art. Oh, I'd gladly shoulder the culpability in this case. 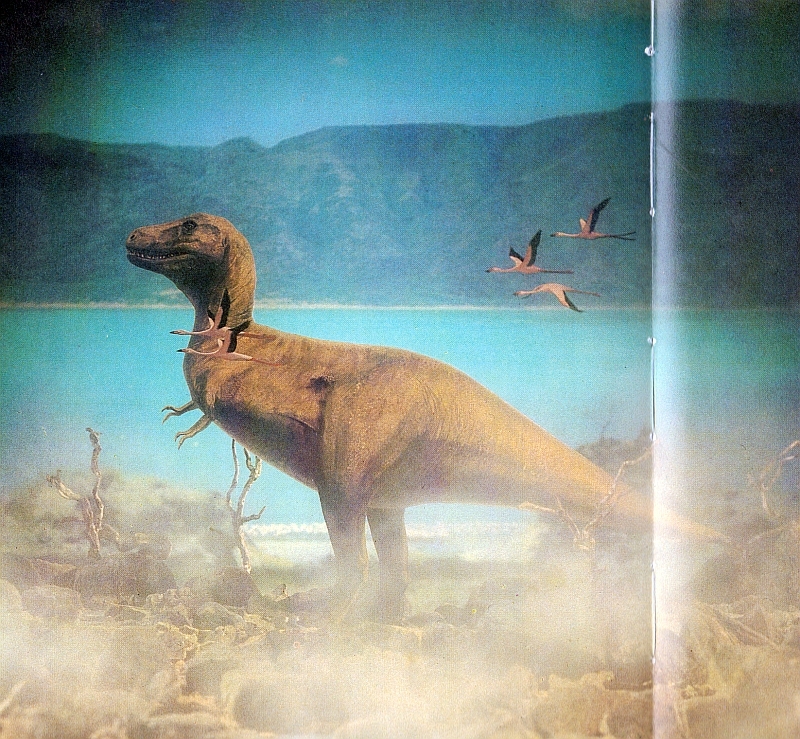 I remember seeing the Tyrannosaurus and Deinonychus pictures in the Eyewitness book on dinosaurs. Neat to see where they came from. Thanks for sharing! So that's where I remembered them from! I knew they had been in one of the many dinosaur books I owned, and that Tyrannosaurus remained my favorite depiction of the beast until I discovered GS Paul's work. I think a part of the cover image has been featured somewhere as well, possibly the same Eyewitness book? 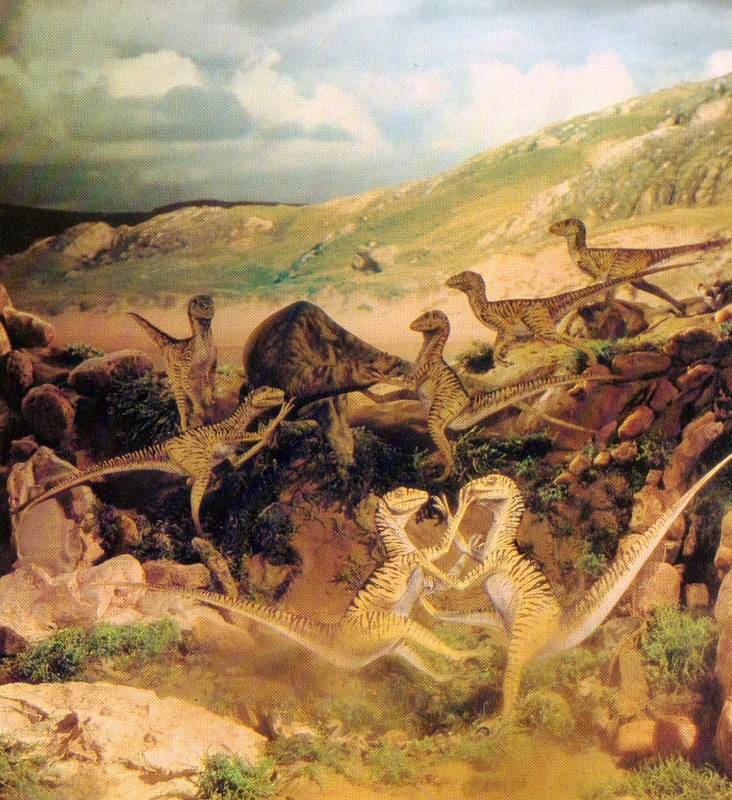 It's really nice to get to see that Deinonychus scene in its entirety at last. I can't remember if I've seen any other depictions of intraspecific fighting among Deinonychuses, even though it is something suggested by fossils. 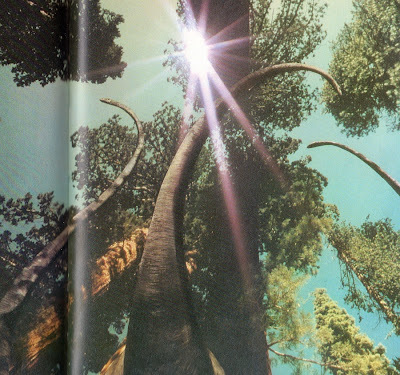 "I think a part of the cover image has been featured somewhere as well, possibly the same Eyewitness book?" Not in the Eyewitness book, but (as I mentioned in my previous post) in an issue of "Ranger Rick". "I can't remember if I've seen any other depictions of intraspecific fighting among Deinonychuses,"
There's Bakker's ( http://4.bp.blogspot.com/-tOVV_O-NGQ8/TdlEpuutQyI/AAAAAAAAAZU/Vu_u5aveH4Y/s1600/86.jpg ), GSPaul's ( http://www.zazzle.ca/deinonychus_dinosaur_raptors_gregory_paul_shirt-235527921060053936 ) & Rey's (See "A Field Guide to Dinosaurs: The Essential Handbook for Travelers in the Mesozoic"). "Not in the Eyewitness book, but (as I mentioned in my previous post) in an issue of "Ranger Rick"." & 1 of the dino covers of Zoobooks. I love Jane Burton's dinosaur photographs! I thank for showing the ones I never saw previously such as the Spinosaurus, Saltopus and the entire Deinonychus scene. Also, how come there's so little information on her on the web? My jaw sort of dropped when I got to the Archeopteryx photo. I'd forgotten how stunningly beautiful that piece is. It's a nice bit of stylization that we don't see that much these days. I always loved this book when I got it out of the library. I think you have indeed grabbed most of my favourites. The Hypie was my favourite as a kid, it always seemed completely real to me. I remember seeing some of these in the Eyewitness Dinosaur book too, especially that a classmate used the Tyrannosaurus image to "prove" that that taxon could swim (evidently not realizing that the animal is not actually in the water, and that some of those birds would be flying below the waterline in that case). Thanks Marc, an old favourite. Loved the pics, but not the text, esp regarding T. rex (this was when I started to think that Mr Dixon wasn't as on-the-ball as I had assumed; led me to see both After Man and The New Dinosaurs in a new light. The cover is fantastic, really eye-catching and what drew me to the book in the first place, but my fave is the Saltopus. The Pterodactylus is lovely, too. @Craig - Regarding ceratopsians, only Triceratops, and no surprise that you didn't recall it as the pic is dull and completely unmemorable. I too remember some of these photos from "Eyewitness Dinosaur". However, I also remember them from an issue of "Ranger Rick". Specifically, I remember the Coelurus & Archaeopteryx photos (which are my favorites in terms of realism/dynamism). I also remember a photo of 2 Tyrannosaurs eating a Triceratops. IIRC, the article was a story about a kid watching a late night dino doc, falling asleep, & then dreaming that he was on a dino safari. Does anyone else know what I'm talking about or am I just a grumpy old man ( http://www.dailymotion.com/video/xkp9co_saturday-night-live-dana-carvey-as-grumpy-old-man_fun )? I have this very book, one of many beloved tomes I had as a lad. All of photos Really Great!!! He Was The Mightiest Of All!